Three major ice sheets are being closely watched by scientists as global temperatures increase, glaciers melt and sea levels rise. 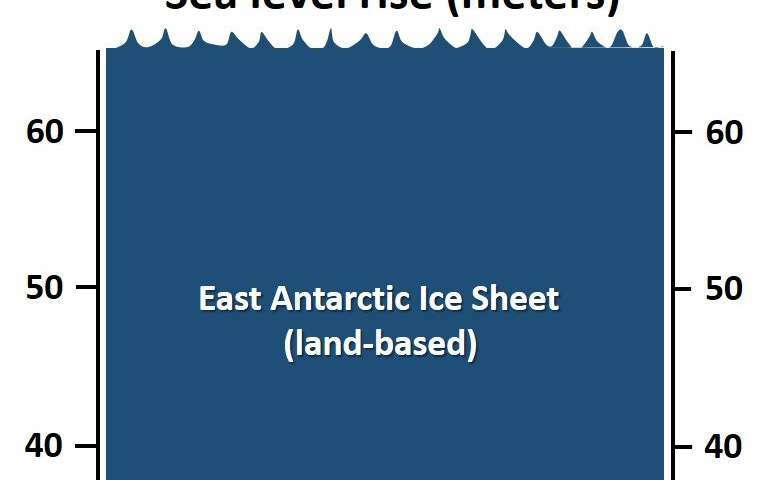 Of the three, the East Antarctic Ice Sheet is the largest potential contributor to sea-level rise. But efforts to predict the East Antarctic's role in future sea-level rise have been hindered by an absence of data about the ice sheet's response to warming periods in the past. The geological history of the massive ice sheet—frozen both above and, in many places, below the ocean's surface—has been difficult to pinpoint. Using ultra-sensitive analytical measurements that have helped to reveal the history of other ice sheets, a team of researchers has found that the East Antarctic Ice Sheet did not retreat significantly over land during the warm Pliocene epoch, approximately 5.3 to 2.6 million years ago, when atmospheric carbon dioxide concentrations were similar to today's levels, a team of scientists reports today in the journal Nature. The findings suggest that some ice on the southern continent could be stable in a warming climate, but do not signal that Antarctica can somehow backstop the impact of climate change, the researchers caution. Ongoing emissions mean that atmospheric carbon dioxide levels will soon surpass the benchmark set during the Pliocene, the last time Earth experienced carbon dioxide levels higher than 400 parts per million. The study focused on terrestrial ice, the portion of the ice sheet that sits above the ocean and sequesters enough water to account for more than 110 feet of sea level rise were the ice sheet to melt away in response to rising air temperature. The other component of the East Antarctic Ice Sheet is so-called marine-based ice, which sits below sea level and is thus directly affected by the ocean. "Based on this evidence from the Pliocene, today's current carbon dioxide levels are not enough to destabilize the land-based ice on the Antarctic continent," said Boston College Assistant Professor of Earth and Environmental Science Jeremy Shakun, a lead author of the report. "This does not mean that at current atmospheric carbon dioxide levels, Antarctica won't contribute to sea-level rise. Marine-based ice very well could and in fact is already starting to—and that alone holds an estimated 65 feet of sea-level rise. We're saying that the terrestrial segment of the ice sheet is resilient at current carbon dioxide levels." Estimates of sea-level rise during the Pliocene have varied, from 20 feet to more than 130 feet higher than today. The upper end of this range would imply that much of the ice on the planet melted, which all together holds enough water to raise sea levels by over 200 feet. If the land-based East Antarctic Ice Sheet was stable during the Pliocene, however, as Shakun and colleagues suggest, the Pliocene total could have been at most about 100 feet. The researchers analyzed sediment contained in drill cores taken from the sea floor. These cores contain geological records, but also chemical signatures. In particular, the rare isotopes beryllium-10 and aluminum-26, which were extracted in the US National Science Foundation-supported Community Cosmogenic Facility at the University of Vermont and measured using particle accelerators at Purdue University's Rare Isotope Measurement Laboratory and Lawrence Livermore National Laboratory's Center for Accelerator Mass Spectrometry. "Isolating these rare isotopes from grains of ancient sand is like finding a very small needle in a very large haystack," said University of Vermont geologist Paul Bierman, a co-author on the new study. "But measuring them gives us a powerful view of Antarctica's past that has never been seen before." Both isotopes are found in rock surfaces that have been exposed to cosmic radiation bombarding the earth from outer space. Researchers usually examine rock samples from hillsides, mountain tops, and rivers to determine where and when ice retreated during prior geological eras. Shakun, Bierman and the other co-authors of the latest report used a different approach two years ago to offer one of the most comprehensive climatological accounts of the Greenland Ice Sheet yet, dating back 7.5 million years ago. 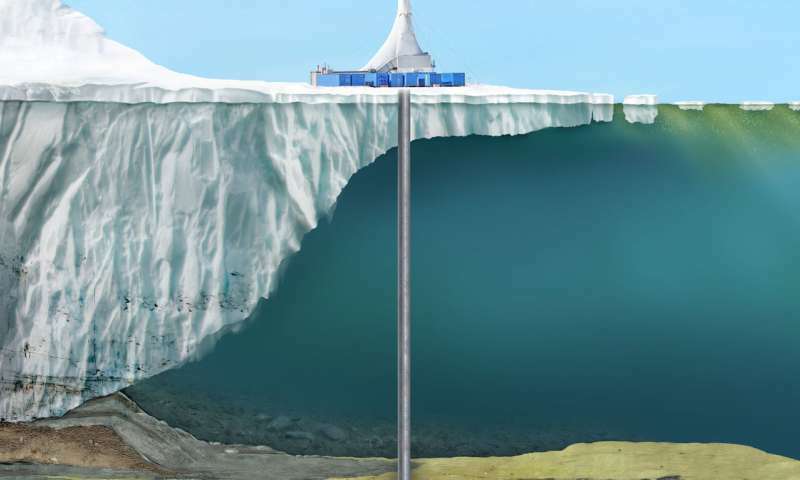 In the Greenland study, levels of beryllium-10 found in sandy deposits brought out to sea in icebergs suggested the ice sheet has been a "persistent and dynamic" presence that has melted and re-formed periodically in response to temperature fluctuations. The findings helped confirm the Greenland Ice Sheet is a sensitive responder to global climate change. Earlier studies of the East Antarctic Ice Sheet indicated that some marine-based portions of the ice sheet and its neighboring West Antarctic Ice Sheet melted back during the Pliocene. But it was unclear whether terrestrial ice also melted. Examining sediment samples delivered from land-based sections of the East Antarctic Ice Sheet, the researchers found those areas that drain into the Ross Sea have been stable during the past eight million years, the team reports. Their analysis found "extremely low" concentrations of beryllium and aluminum isotopes in quartz sand in the marine sediment samples taken in the region. "The findings indicate that atmospheric warming during the past eight million years was insufficient to cause widespread and/or long-lasting meltback of the EAIS margin onto land," the team of scientists write in the new study, titled "Minimal East Antarctic Ice Sheet retreat onto land during the past eight million years." The findings not only clarify the past impact of rising temperatures on East Antarctic ice, but confirm the accuracy of models scientists are using to assess past and future consequences of a warming planet. "These findings add to the growing body of evidence that curbing levels of atmospheric carbon dioxide can still ensure the stability of significant amounts of ice in Antarctica and around the globe," said Shakun.